If you like art, tile, and learning this fun new workshop series is for you! We’ve partnered with Debbie Dickinson, a local mosaic artist, specializing in original handcrafted tile murals and special installations. Debbie first learned her craft while working in the building industry, and is dedicated to sustainability, using discarded and salvaged tile and stone when possible. 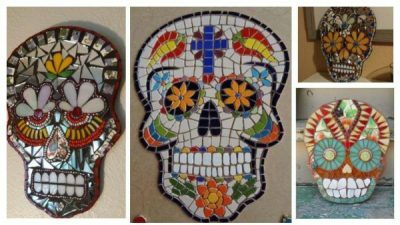 Prepare for the Mexican holiday of Dia de los Muertos by designing and building your own mosaiced day of the dead skull to hang on your wall. This class teaches you a few techniques for working with glass and ceramic tiles. You will learn design basics as you create a mosaic using a simple indirect application method. Leave the completed mosaic with us to do the messy cementing and grouting and come back later to pick up your completed masterpiece! Each class has a 15 person limit, and a 4 person minimum. Sign up soon, this new workshop series is filling up fast. There are multiple classes a week, so find a friend, pick a time and get ready to create. Day of the Dead (Spanish: Día de Muertos) is a Mexican holiday celebrating and honoring the dead. Prior to Spanish colonization, the celebration took place in the summer. Today it is often associated with October 31, November 1 and November 2 to coincide with Halloween. Traditions include building an alter to honor the dead, and decorating it with art, flowers and food. A common symbol for the holiday is the skull ( in Spanish calavera), a symbol often represented in masks, food, art, and costumes.